Here at full-volume.co.uk we set cookies by default to make your browsing experience better. To comply with the e-Privacy Directive, we require your consent to set these cookies. Information on the cookies we use can be found here. 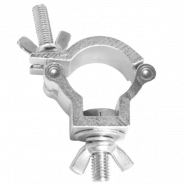 Product Description CLP-35HC is a heavy duty aluminum clamp designed to fit the TRUSST® Arch and Goal Post Truss Kits ..